In the age of Internet and globalization, consumer demands for customised and unique products are pushing manufacturing companies to adopt flexible manufacturing practices. Consider the case of eyewear ecommerce that requires several workers at the production line to build thousands of eyeglass frame variations for customer choices that evolve on a daily basis. A traditional industrial automation system can’t possibly offer the flexibility to meet changing customer demands at scale and speed. Instead of developing standardized products optimized for the masses, factories of the future must leverage intelligent technologies capable of performing tasks that are less predictable and require real-time decision-making capabilities. In fact, smart factories in the Industry 4.0 era should offer mass customisation without compromising manufacturing speed and quality. With advancements in AI, a truly smart factory can realise these capabilities by deploying intelligent robots that can learn and think like their human counterparts and yet safely operate alongside the human workforce. 1. Quality Control and Predictive Maintenance: A recent PWC research found that the use of big data analytics and AI adoption for predictive maintenance in manufacturing industries will increase by 38 percent over the next five years. Connected technologies, sensors and robotics enable organisations to understand the performance patterns of assembly line machines and identify potential maintenance issues ahead of schedule or downtime. With this capability, manufacturing companies will no longer need to rely on fixed maintenance schedules. Performing maintenance routines too soon results in wasted labor and undiagnosed machine failures. Performing the maintenance routine too late risks equipment malfunctioning during production and reduces the machine life span. As a result, organizations can avoid unplanned downtimes, improve the performance lifespan of machines and maintain productive manufacturing operations. 2. Intelligent Robotics Collaborating with Humans: Intelligent robots with precision capabilities for performing intricate movements can take over tasks that would be tedious or dangerous for people, to improve productivity and safety in factory operations. Often, this requires close collaboration with both the human workers and the environment. For example, Epson’s vision system can enable robots to “see”, and its algorithm software is able to detect colour and shapes of objects, as well as positioning and orientation of the objects through a camera. In an assembly line, it can auto-calibrate on where to pick, even if the item has fallen or positioned out of place. 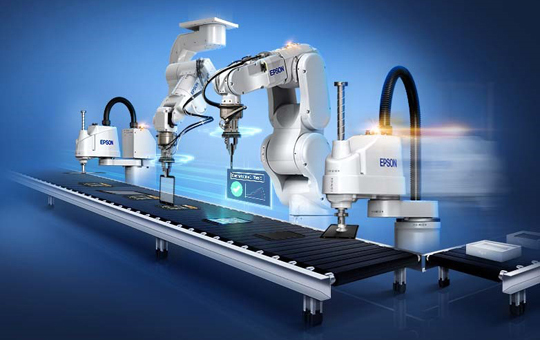 Combined with Epson’s force sensor which employs Epson’s proprietary piezoelectric quartz sensing technology that is sensitive to minimal force, the robots can perform complex tasks such as precise assembling of delicate components. 3. Safe Workplace: AI and robotics technologies augment workplace safety by replacing humans to perform manufacturing tasks that pose life-threatening risks to factory workers. A recent McKinsey research found that AI-enabled visual inspection can improve defect detection rates by 90 percent compared to the traditional methods of manual inspections. While robots can entirely replace human workers to perform certain risky manufacturing processes, they must work together with humans on several tasks that require human supervision. The next-generation AI-robotics technologies will be designed to work alongside humans and manage safety standards and production performance instead of merely automating repetitive tasks. These robots can be programmed to identify risk to humans as they interact with factory workers. Sensors embedded onto robotic arms can help identify when humans are in close proximity and maneuver accordingly. 4. Going Beyond the Supply Chain: AI makes it possible to adapt and strategize manufacturing processes and production routines based on external factors beyond the shop-floor. Advanced machine learning algorithms can reduce stock forecasting errors and inventory by 50 percent according to the McKinsey research. Robots can be programmed to adapt production scheduling and performance based on real-time analysis of inventory and supply chain constraints. This flexibility is critical to automate lean manufacturing operations that would otherwise require significant changes and efforts on behalf of factory workers. Progressive manufacturing organizations lead the industry with their ability to adapt production capacity and fulfil market demands that change on a continuous basis. With artificial intelligence, systems can analyse market data and robotics performance to make key decisions on demand and supply. As a result, they can always stay ahead of the competition and prepare for abrupt changes in market demands to maximise profitability. Epson provides a range of compact robots with flexible positioning and is equipped with intelligent force sensors and vision sensing options—providing factory automation solutions from adjustment to existing lines to embarking on the automation journey.